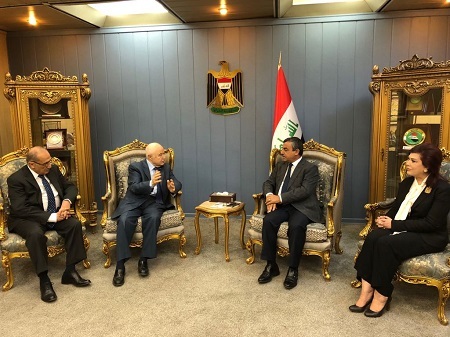 BAGHDAD - HE Dr. Talal Abu-Ghazaleh held separate meetings with high ranking Iraqi officials including the Secretary-General of the Iraqi Council of Ministers HE Dr. Mahdi Al-Allaq, Iraqi Minister of Planning HE Salman Al-Jumili, and Minister of Labor and Social Affairs HE Eng. Mohammed Shayaa Al-Sudani. The meetings were held in the presence of HE Dr. Jawad Al Anani, former deputy prime minister of Jordan, Iraqi Ambassador to Jordan HE Safia Al-Suhail, and twenty directors representing various activities at Talal Abu-Ghazaleh Organization (TAG-Org). During his meeting with Dr. Al-Allaq, Dr. Abu-Ghazaleh stated that e-government is the ideal solution for achieving transparency and credibility in the performance of all government agencies stressing the importance of activating governance as a precautionary measure to thwart corruption and violations. He referred to various areas of cooperation between Iraq and Jordan and called for cooperation in development of integrity standards based on Jordan’s experience in this field, proposing the establishment of an independent council of ministers to supervise planning and implementation of e-government in Iraq. In addition, Dr. Abu-Ghazaleh called for the establishment of an Iraqi-Jordanian council for cooperation and construction adding that Talal Abu-Ghazaleh Organization will provide the Ministry with a proposal for establishing the Iraq-Jordanian Cooperation Council. Dr. Abu-Ghazaleh, meanwhile, advocated support for national investments and attracting Iraqi investors from outside Iraq, reiterating TAG-Org’s readiness to provide all required services that support the use of smart cards in Iraq. In his meeting with Al-Jumili, Dr. Abu-Ghazaleh expressed Jordan’s eagerness, particularly by the private sector, to cooperate with Iraq and proceed with the Desert Route project from the Jordanian side to activate the Al-Karamah Border Crossing and increase trade between the two countries. He also suggested the establishment of the “Middle Zone of the Arab World” to create economic cooperation and establish new infrastructure in countries including Iraq, Syria, Lebanon, Jordan and Palestine within a well-studied plan for reconstruction noting that this project has been already discussed with the Chinese party for the required funding. Abu-Ghazaleh also underlined the importance of proceeding with the 'three-tracks of illiteracy' project, capacity building initiatives, particularly in the field of judicial training and proposing capacity building and training cooperation in the fields of English language, computer skills and Internet, as well as the provision of an Internet line to Iraqi universities through ASREN. He also acknowledged the importance of Talal Abu-Ghazaleh International Diploma in IT Skills (TAGDIT) certificate. Meanwhile, Al-Jumaili underlined the deep-rooted relations between Iraq and Jordan attributed to strong political and social bonds noting that there are various initiatives between the two countries that need to be activated. He also discussed a plan to activate the already signed Jordanian-Iraqi agreements and proceed to implementation phase stressing the importance of development as the cornerstone in finding balance in the field of investment. In his meeting with Minister Al-Sudani, agreement was reached for the establishment of a central project that connects libraries in Iraq with international libraries worldwide while providing all required infrastructure, in addition to the establishment of an Iraqi-Jordanian knowledge forum to exchange expertise in the fields of education, business, culture and management among others. Dr. Abu-Ghazaleh announced his decision to open a third office for Talal Abu-Ghazaleh Organization in Iraq, in addition to the existing offices in the governorates of Baghdad and Erbil.